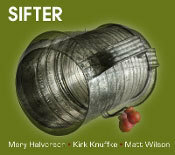 Anyone expecting a set of free improvisations from the triumvirate of guitarist Mary Halvorson, cornet player Kirk Knuffke and drummer Matt Wilson might be surprised by Sifter-pleasantly surprised. All three musicians bring compositions to the table. Knuffke’s six tunes give him the most representation, though Wilson contributes five. Halvorson only brings in two pieces, but her personality plays a key role throughout. Ultimately, Sifter is more about what three musicians create together rather than the way one writer tries to shape the sound. While the music has structure, it leaves plenty of opportunities for cutting loose as the spirit moves. “Cramps” begins the set with Wilson playing a shuffle with brushes and Halvorson playing single notes like a bassline under Knuffke’s bright melody. Soon enough, Halvorson is playing a distorted solo laden with fuzzy harmonics. Her “Forever Runs Slow in Cold Water” begins with guitar and cornet countermelodies, eventually leading to a solo marked by weird, warped effects. Throughout the album Knuffke frequently starts playing with a crisp tone only to turn raspy during a solo, building up to squawks or smears. Wilson, as he often does, approaches the music with plenty of enthusiasm and humor. His solo during his “Always Start” builds on the composition’s stop-start theme with a series of single drum cracks. In “Proper Motion,” he plays a cymbal solo and really makes the limitations in timbre work. Overall, his use of the toms and bass drum fill out the sound, making sure Sifter never gets too spare.